Discussion in 'Competitive Riding Events' started by fitter, May 3, 2016. 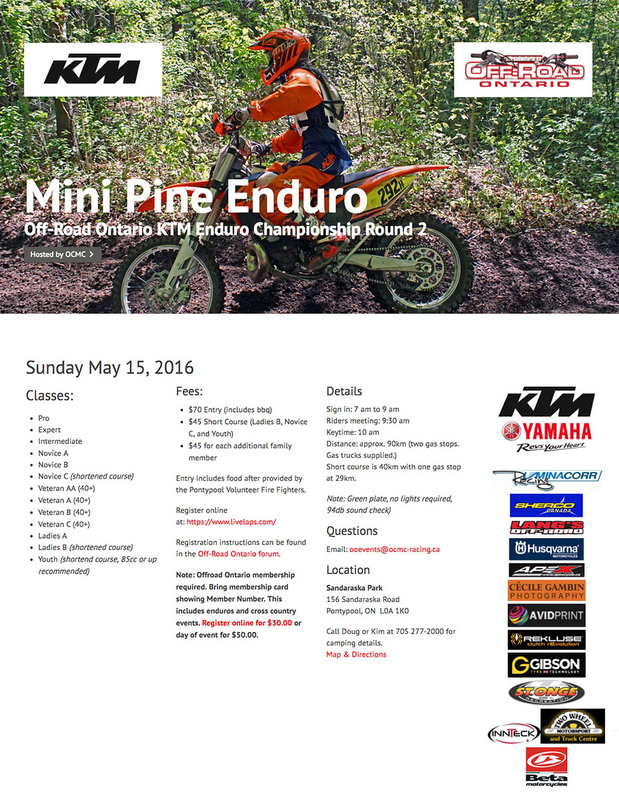 Here is the revised flyer for the Mini Pine Enduro. Please note Pre-registration will open at 19:00 on Wednesday. May 4th on the LiveLaps website. It is strongly recommended that you pre-register if you wish to avoid lineups. There will be an Express Registration Line for those that have pre-registered. You should also renew your OffRoad Ontario membership online if you have not done so. To pre-register you require a LiveLaps account. If you do not have a LiveLaps account the process is explained here. Please be advised that if you do not already have a LiveLaps transponder you will be required to purchase one at the MiniPine to be scored. Details are available on the OffRoad Ontario forum. Cost of the transponder is $15. Exact change would be appreciated.